The pollen has started here in Georgia. It actually started about a week or so ago, but it's really ramping up quickly, and soon everything will have a green/gold powder coat. And even if you're not allergic to any of it, you'll still cough and sneeze, because it's like getting a handful of flour thrown in your face whenever you walk outside. So, obviously, it's best to stay inside and game. Or, in this case, stay inside and work on your terrain game. Quick Terrain Corner for you today. Just one story. But it's a good one. My old friend, Dave Taylor, is running a Kickstarter campaign for his Terrain Essentials guide, written by Mel Bose of The Terrain Tutor. Mel Bose – The Terrain Tutor – has been building terrain for almost as long as he can remember. When he was five, Mel built playsets for his little green army men in the corner of the craft store his mother ran. He was often assisted by model railroaders who were regulars at the store and, by the time he saw his first White Dwarf magazine at age 15, Mel was primed for a life of building terrain. Mel has traveled the world, as a medic in the army, a physiotherapist, and even a salesman. He has worked with people from all walks of life, and looked at things from many different perspectives. It is this approach that he brings to his successful YouTube channel (The Terrain Tutor, click the image below to check it out). For the last fiveyears, Mel has been able to make a living from sharinghis passion – teaching people everything he knows about building terrain for tabletopwargaming, for hobbyists, clubs, displays, and for dioramas – and it’s that passion and knowledge that he is bringing to this book, TERRAIN ESSENTIALS. 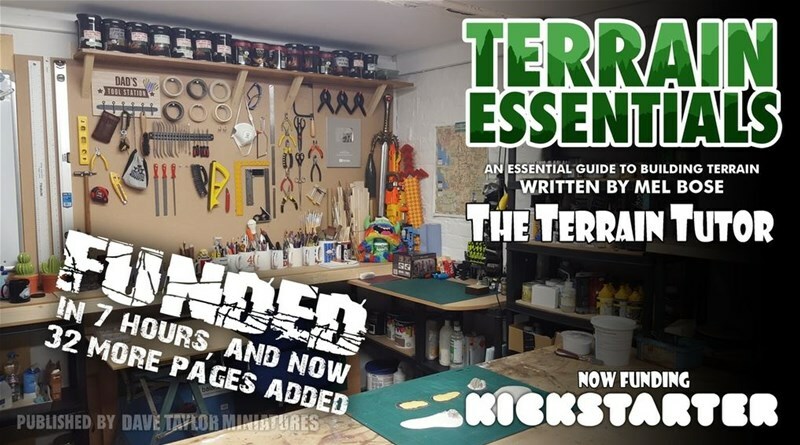 This Kickstarter campaign is to fund a printed version of the book – TERRAIN ESSENTIALS – a 96+ page book perfect to add to the collection of anyone with an interest in creating excellent tabletop terrain, regardless of purpose or the builder's ability.